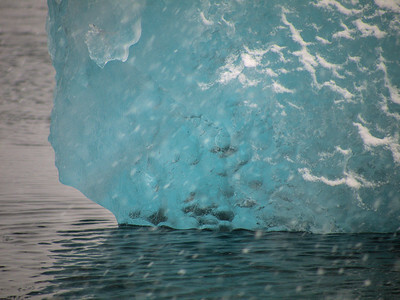 Icebergs fascinate me. Their variety of form, the hidden blue colors, their cliffs. The caves and cracks that shape their surface. The hidden massiveness below the surface that sank the Titanic. A symphony of sounds from their resistance to wind, the crackling and booming as they reshape themselves. Floating flotsam from flowing frozen fluid. The icebergs have left their home. The massive ice-covered continent of Antarctica. Covered in fresh snow, carrying the millenniums of storms that have built up over time to form the ice below their exposed surface. Windswept by the Antarctic tempest they sail across the straits and surround the mainland. The ocean pounds their edges forming wave cut terraces. Occasionally you can see the slow steady push of the glacier calving into the water to launch a new iceberg. 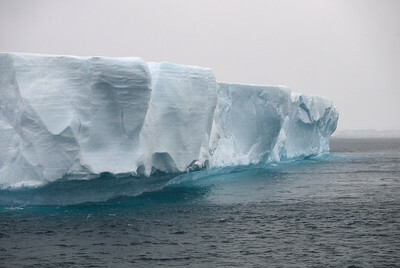 Tabular icebergs float like massive ships, their flat tops stretching out. The occasional growler appears bobbing along as the ice breaks down.